Stop by the Co-op soon and get your copy of the July-August Co+op Deals coupon book! There are plenty of great new products to try and delicious deals on your favorites, like Rudi’s Organic Bakery breads, Organic Valley cheese, Muir Glen salsas and so much more. It’s a great time to stock up on picnic supplies like spritzers, juice, nut butters and chips, too. 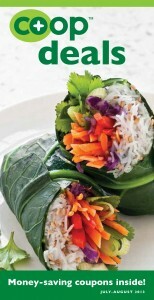 Get great recipes and ideas for celebrating summer at www.strongertogether.coop. Look for the coupon books at the Co-op beginning in July. This is a national program through our membership with National Cooperative Grocers Association (NCGA). We carry most of the items in the coupon book, but not all, so check the store or ask one of our friendly workers. Your potential savings if you were to use all the coupons in the book on items we carry would total nearly $20. We will have coupons available at the shelf on many items as well. Coupons are valid through August 31, 2013. To see a sample of the coupon book, click here. The River People Farmers Market started its season on Thursday June 20, 2013 in downtown Astoria. In the photo Co-op Board President, Allie Evans (along with her beautiful children) and Co-op Board Member Mark Albrecht, are in the Co-op booth preparing food samples for market-goers. This is an opportunity for us at the Co-op to take food demos outside our walls, to potential new customers. Our board members take turns staffing the booth to meet and interact with our members and other shoppers. The turnout seemed impressively high when the market opened. This is one of the North Coast Food Web’s efforts to connect local farmers and their food with local people. 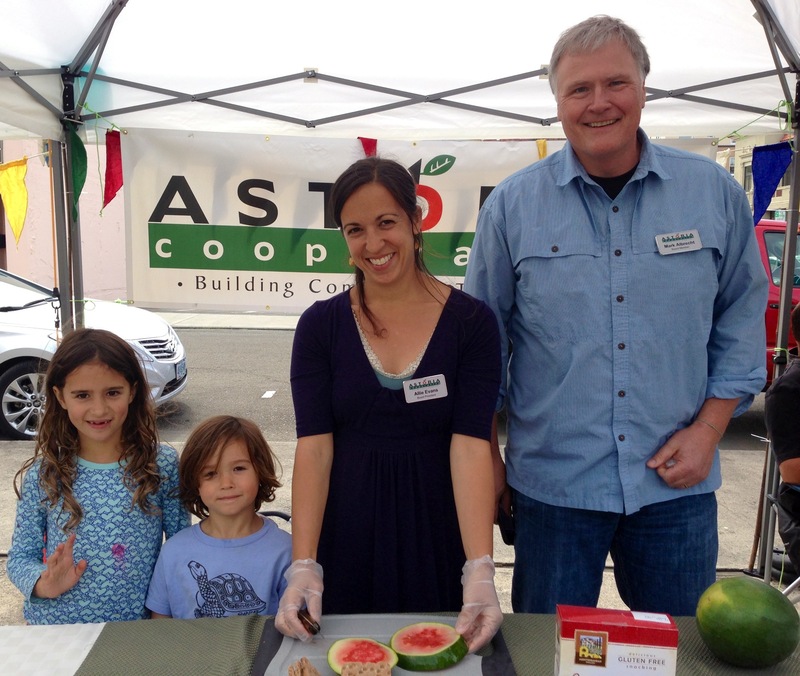 The Astoria Co-op has partnered with the Food Web and other local entities to provide funding for food stamp recipients to have access to the fresh market produce. The River People Farmers Market is held from 3pm-6pm in the Astoria Indoor Garden Supply lot, at 1343 Duane Street (right across the street from the Co-op). The market goes through October. Co+op Deals is Here! What is that you might ask? Early this year our Co-op officially became full member owners in the National Cooperative Grocers Association (NCGA). This cooperatively run business services organization partners more than 120 nationwide food co-ops in order to provide purchasing power, staff development programs, financial oversight, and, most notably for our co-op shoppers, a promotional program called Co+op Deals. The Co+op Deals program consists of several components, the most prominent of which is a bi-monthly sales flyer. Beginning in June, our co-op will distribute these sales flyers throughout our region via the Daily Astorian. We know that you’ll be pleasantly surprised at the competitive pricing inside the flyer. We’ll be highlighting some of the best deals on our sales endcaps in the front of the store. We’ll even have local artists chalking up fun graphics above these sale displays (if you’re interested in helping with these chalkboard signs, email zetty@astoria.coop). You’ll notice these displays changing every two weeks in connection with the sales flyer. Co+op Deals will be communicated in store through specific signage. These sales will be available to all shoppers. Our aim is to introduce the co-op to new shoppers by showing them that our store provides competitive pricing on key or staple items. While they check out the organic olive oil for $8.99, they won’t be able to pass up the fresh produce, tasty organic deli, friendly staff, and all the other wonderful things our co-op has to offer. Before they know it, they’ll be co-op owners just like you! The Co-op will still feature member/owner sales. New signage will clearly indicate that a sale is a member-only deal. These sales are an additional member benefit that we will continue to offer on a monthly basis. Weekly produce sales will also remain member-only specials. In addition to the bi-monthly sales flyer, the Co+op Deals program will include a coupon program that permits additional savings at the Co-op! Don’t worry; we don’t expect you to do a bunch of coupon clipping. We’ll post coupon tear off pads right in front of the products to which they apply. Once in a while a coupon will apply to a product that is on sale too. That means some pretty good deals! Our first coupons will hit the store in July. They are valid for two month periods and are available to all shoppers. All in all, the Co+op Deals program accomplishes what our co-op could never do alone. Only through the combined effort of many co-ops across the country can we offer this additional value to our community. Help us share the program with friends or family who may think the co-op is too expensive. Co+op Deals will prove that the Astoria Co-op can be your go-to grocery store!